Mick Bohan was delighted to welcome Sinéad Finnegan back into the fold at the DCU Sportsgrounds on Saturday as Dublin recorded a convincing 10-point victory over Monaghan in Division One of the LIDL National Football League. A defensive stalwart in the back-to-back All-Ireland successes of 2017 and 2018, Finnegan completed the full 60 minutes on her first appearance of the year. "Finno is back, it's great. She hasn't been with us all year. She came back with us this week, we're delighted to have her back. 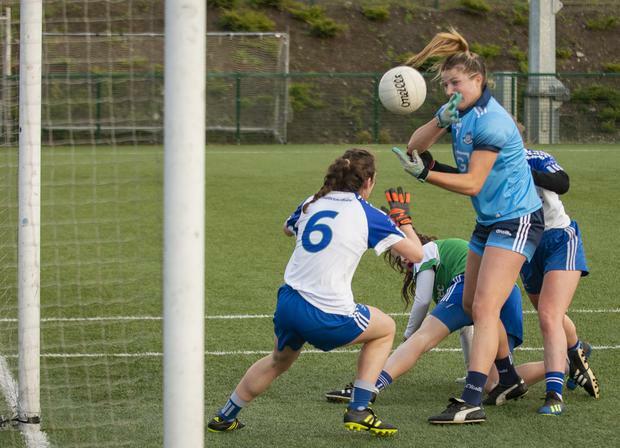 She obviously played the colleges with DCU, but she's in good fettle," the Dublin boss said. The Clontarf man is gradually re-integrating some key figures as the league progresses, while also giving some fringe players an opportunity to shine on the big stage. Following brief cameos in wins against Donegal and Westmeath, reigning Football of the Year Sinéad Aherne bagged an impressive tally of 3-3. The Cork-based Noelle Healy also chipped in with three points, but there are others who are expected to return for Sunday's trip to a high-flying Galway. "She (Aherne) has had very little game time. Ultimately, those players need games too. You can't expect them to be match sharp if they haven't played. Obviously the likes of Noelle, that's her second game back with us. Every time she's travelling from Cork, so she needs games as well. "We'd a lot of the girls like Niamh McEvoy, Martha Byrne and Niamh Collins playing colleges. We gave them a bit of a break this week." In total, Dublin started with five of the team that defeated Cork in last September's All-Ireland decider at Croke Park. Three of that line-up were introduced off the bench as half-time substitutes - goalkeeper Ciara Trant, Lyndsey Davey and Carla Rowe - before Nicole Owens also entered the fray during the latter stages. Despite coming under some early pressure from the Farney county, Dublin established an outstanding 5-3 to 0-3 cushion on the first-quarter mark. The elusive Aherne claimed a hat-trick in this period, supplementing additional efforts by Siobhan Woods and former Republic of Ireland international Siobhán Killeen. To their credit, Monaghan staged a mini rally that included a three-pointer for Ciara McAnespie. Dublin's inside forward line of Aherne, Healy and Killeen continued to make hay, however, and they brought a 13-point buffer into the break (5-7 to 1-6). A plethora of replacements meant the hosts were a little disjointed on the restart and Monaghan susbsequently grabbed two goals through Muireann Atkinson and Leanne Maguire (penalty). Nevertheless, Rowe (two), Davey and Orlagh Nolan added their names to the scoresheet, propelling Dublin towards a four consecutive league triumph. A semi-final place will be guaranteed with one point, Bohan is looking forward to facing the in-form duo of Galway and Cork. "Next week, it's a different level now. Obviously Galway are top of the table and Cork had a smashing win against Donegal. We know the quality is going to step up," Bohan added. Scorers - Dublin: S Aherne 3-3 (0-3f), S Killeen 1-2, S Woods 1-0, N Healy 0-3, C Rowe 0-2, J Dunne, N Hetherton, O Nolan, L Davey 0-1 each. Monaghan: L Maguire 1-5 (1-0 pen, 0-3f), M Atkinson 1-2 (0-2f), C McAnespie 1-1, C Courtney 0-2. Dublin: R Fleming; R Ruddy, O Carey, C Ruddy; S Finnegan, K Fitzgibbon, L Magee; J Dunne, N Hetherton; H O'Neill, S Woods, K Sullivan; S Aherne, S Killeen, N Healy.Subs: C Trant for Fleming, S Fagan for C Ruddy, O Nolan for O'Neill, L Davey for Woods, C Rowe for Sullivan (all h-t), E Kehoe for R Ruddy (44), C McGuigan for Killeen, N Owens for Magee (53), O Whyte for Aherne (56). Monaghan: N McGuirk; N Kerr, S Boyd, H McSkane; A McAnespie, R Courtney, A McCarey; S Coyle, E McAnespie; C McBride, L Maguire, E Woods; C Courtney, M Atkinson, C McAnespie. Subs: C Treanor for McBride (43), B McAleer for McSkane (53). Mentors - Dublin: Mick Bohan, Ken Robinson, Sorcha Farrelly, Paul Casey, Paul Gilheaney, Kathleen Colreavy. Monaghan: Niall Treanor, Ciaran Murphy, Seán McDermott, Adam Treanor, Angela McKenna. Wides - Dublin: 5 (2+3). Monaghan: 2 (2+0). Conditions: Mixed weather, but mostly dry and settled. Player of the match: Sinéad Aherne (Dublin).